The Whole Foods Market store in Dedham, Mass., is recalling single-serve organic vanilla yogurt parfait cups with strawberries and granola. The granola contains almonds, an allergen not declared on the label. 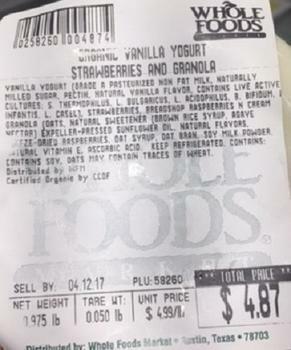 The recalled product is packaged in single-serve clear plastic containers labeled as “Organic Vanilla Yogurt Strawberries and Granola”, PLU number 25826 with a “Sell by” date between April 2, 2017, and April 11, 2017. Customers who purchased the recalled product may bring their receipt to the store for a full refund. Consumers with questions should contact the store at 781-329-7100.